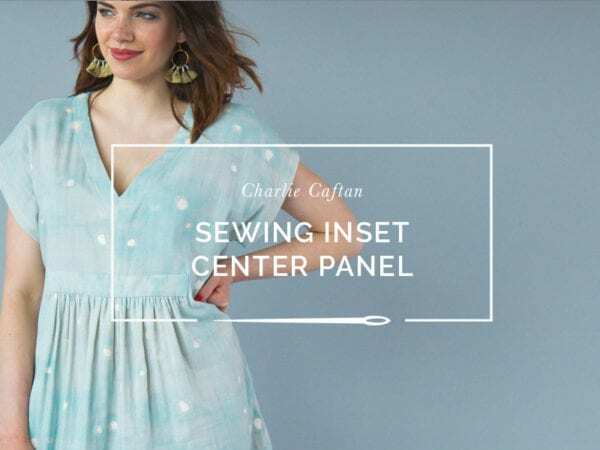 Today we are wrapping up posts on our Charlie Caftan pattern with this tutorial on sewing a V neckline with woven fabrics. 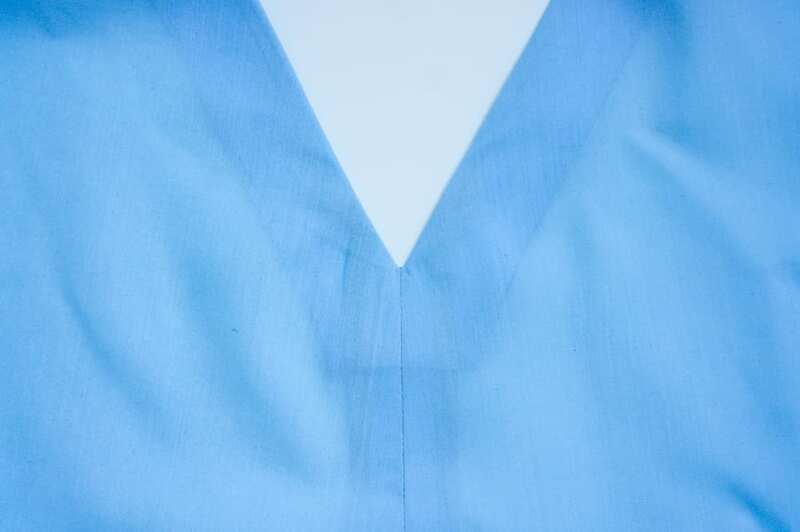 Sometimes this type of neckline can result in some gaping or rippling since the fabric is cut on the bias, and because there are a couple of layers of fabric that can shift around when dealing with the facing. 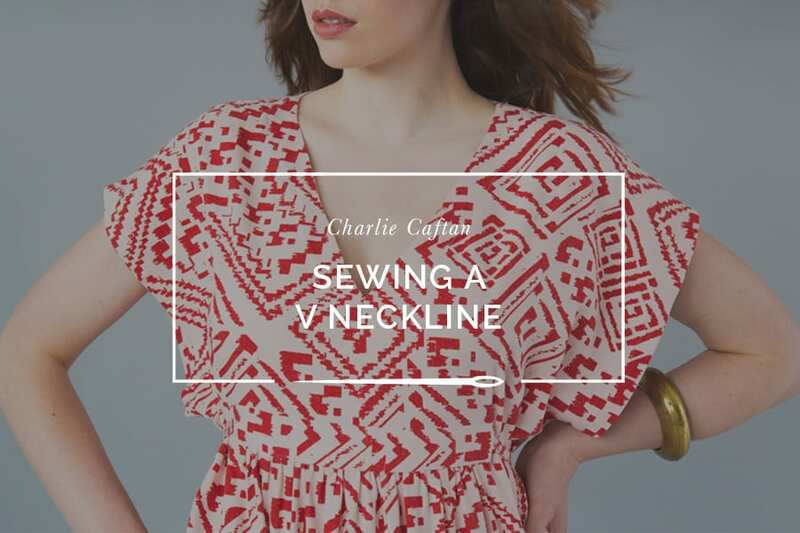 Hopefully this post will help you create a lovely neckline on Charlie, or any other V necked shirts in your future. 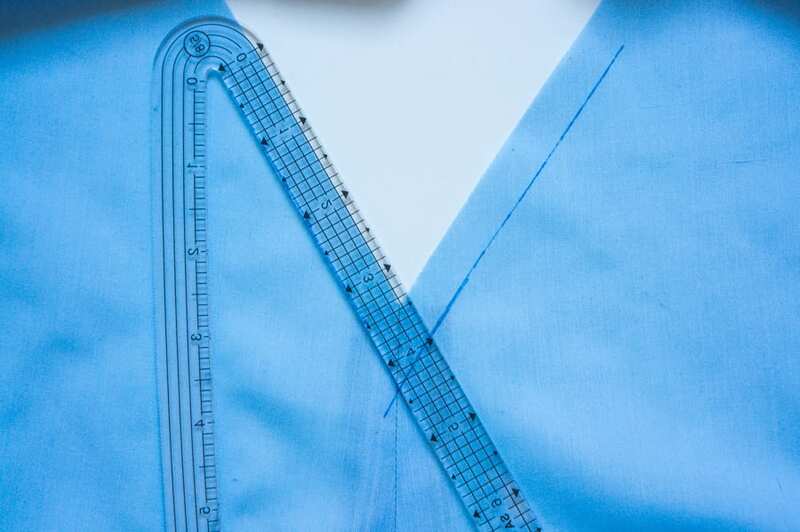 Before we begin, your front and back pieces should be sewn together along the shoulder seams at the 5/8″ seam allowance. 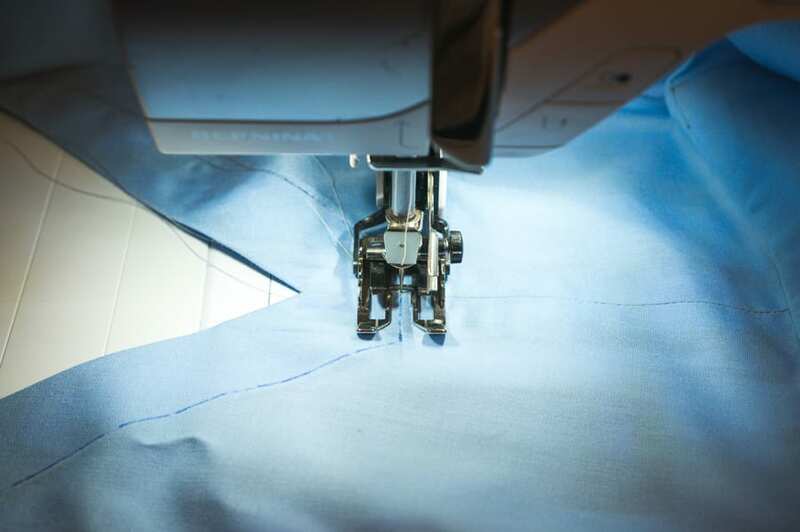 You’ll want to finish the raw edges using either a serged or zig-zag stitch, or with a french seam (make sure you pay attention to the slight angle at the hem along the arm opening). Press your seams to the back. 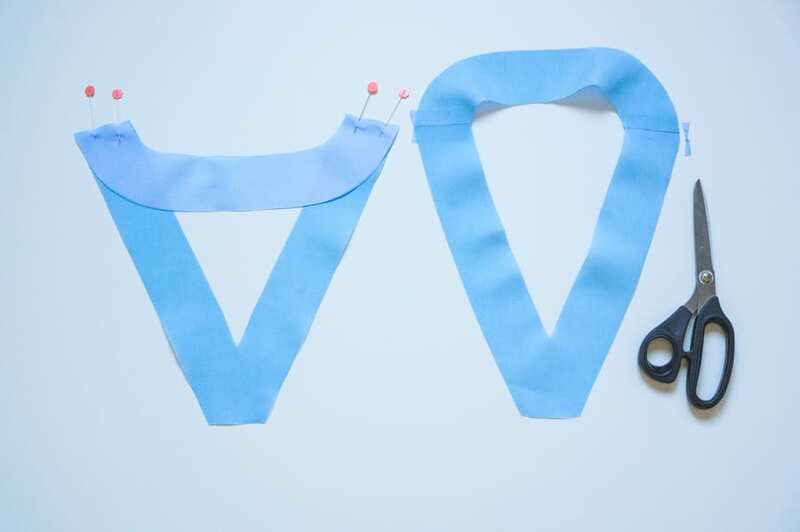 Since V necklines are cut on the bias, it’s important to stay-stitch around the perimeter of the neckline so it doesn’t stretch out. You’ll want to sew this stay-stitch line within your 5/8″ seam allowance so you don’t see the stitching once the facing is sewn in place. When you are sewing around the point of the V, it can be tricky sewing at equal distance on both sides, so I like to draw in my stitch lines with either a quilting ruler or this handy seam allowance guide using a disappearing or removable marking tool. 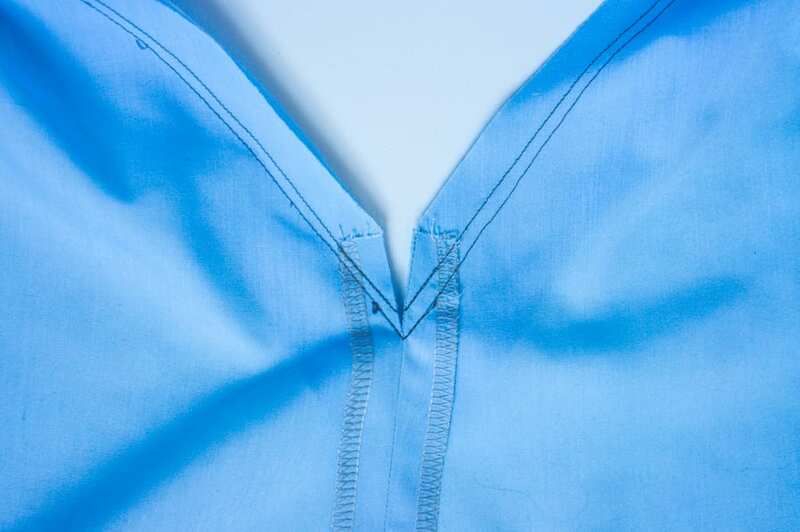 By lining up the seam allowance (in this case 1/2″ so it’s not visible on the finished garment) along the neckline of the garment and then continuing the line down to center front, you can ensure an accurate line of staystitching. 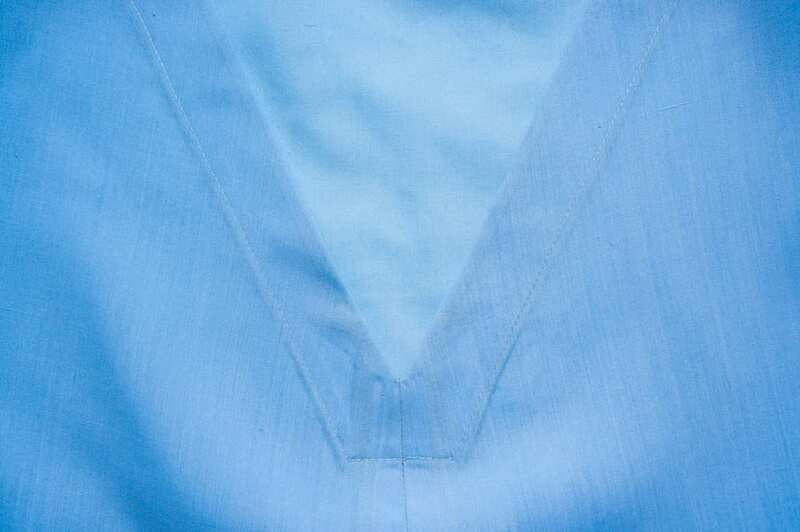 I find I often don’t sew a deep enough V neckline if I’m just counting on the seam guide of the needle plate. 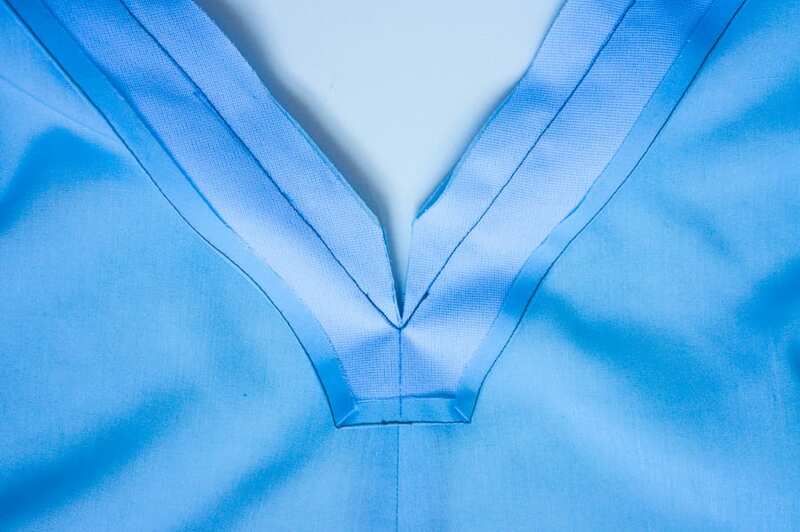 Instead of sewing one continuous line of stitching all around the neckline in one go, I recommend sewing each side of the neckline separately. Using a shorter stitch length, start about 1″ before the V, keeping your needle down to turn the point, and keep sewing until you reach the center back. Then repeat in the opposite direction. 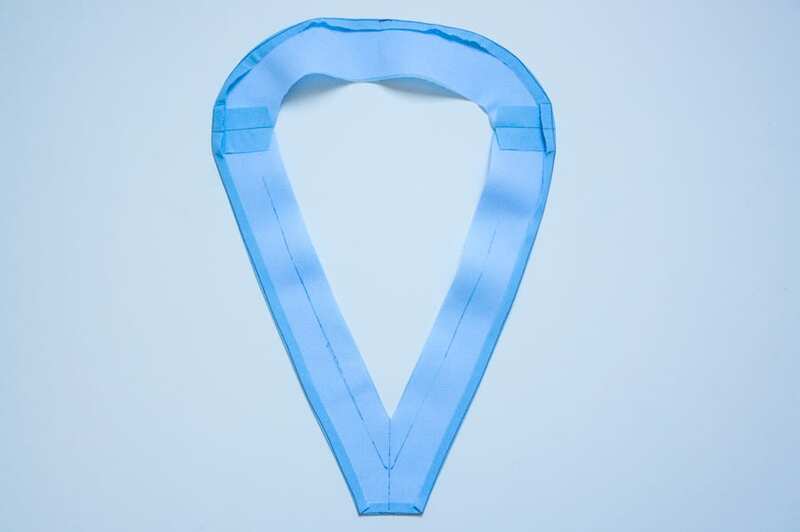 You’ll find it will help prevent the fabric from rippling or gaping later, since the fabric isn’t being pulled in opposite directions as you go around the neckline opening. If you’re really worried about gaping, sewing in some twill tape or using a little iron in stabilizer will definitely help as well. Now we’ll prepare the neckline facing. Your front and back neckline pieces (D & E) should be interfaced. Line these pieces up along the shoulder seam with right sides facing and stitch together with the 5/8″ seam allowance, then press your seams open. If any corners of fabric peek out, you can give them a trim. The outer raw edge of the facing needs a clean finish. You can choose either to serge around this edge, or fold and press it in by 1/4″ so that when the facing is installed, the raw edge is tucked inside. 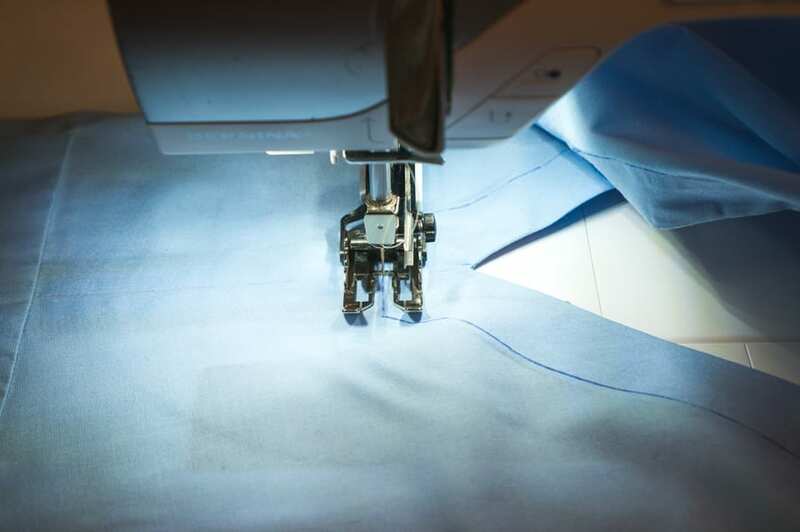 If you prefer to fold the raw edge in, you may find it helpful to sew a line of stay-stitching along your fold line so you have something to press against. Before pinning the neckline facing in place, I also find it helpful to draw in my stitch line, just like I did for the bodice. I also mark my center front, so I can line it up perfectly with the center front of the bodice. With the right sides of the neckline facing and caftan bodice together, pin the facing in place, matching the shoulder seams and the V point. This is where your drawn guide becomes helpful, since it really shows you where the V point should line up along center front. 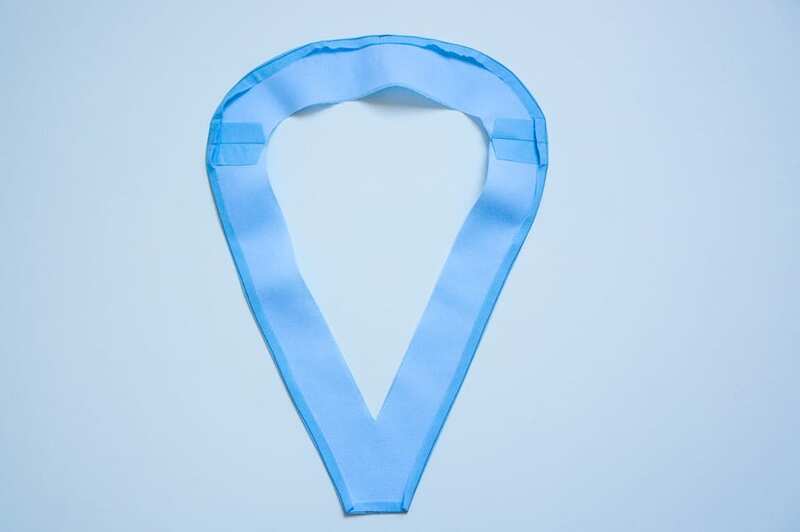 Sew around the neckline at 5/8″ seam allowance to secure the facing to the dress. Again, I recommend sewing each side of the neckline separately like we did for the stay-stitching earlier. Since this means sewing over the V point twice, it will also reinforce the area we will clip into in the next step. Here you can see I’ve sewn one side of the neckline from center front to center back. Repeat for the other side. It’s time to flip the facing to the inside of the garment. Make sure the facing is perfectly centered on the V point. If it’s a little off-center, it’s easier to fix it now before we clip into the V point. Using a sharp pair of scissors, clip straight down the V point without clipping your stitch line. It’s important to clip as close as you can to the stitch line without cutting any stitches. If the tips of your scissors are dull, or if you make the cut off-center, it will be hard to make a close and clean cut. This is what you should see from the inside. 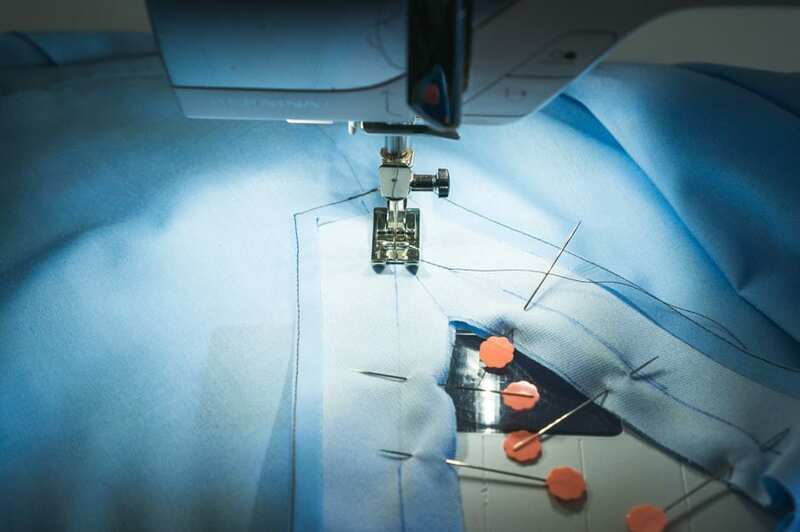 You will have cut through your first line of stay-stitching, but not through the stitching attaching the facing and bodice together. 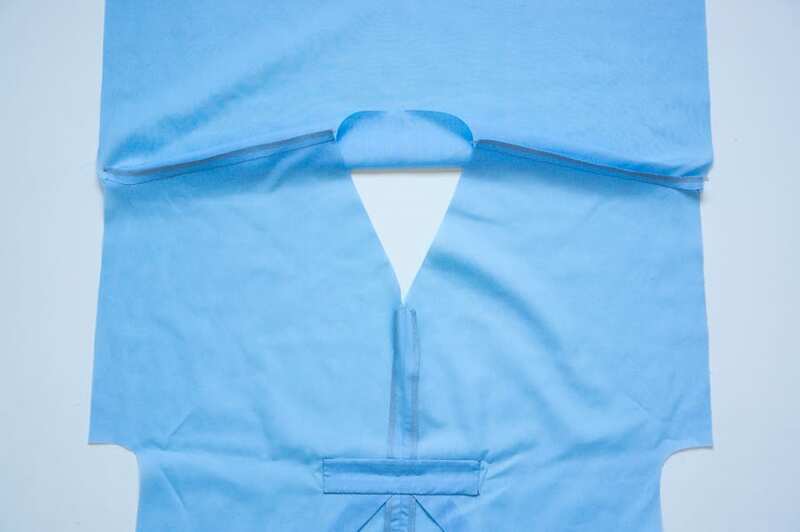 Fold the facing to the inside of the caftan and give it a really good press. I like using a tailors ham or sausage around the curve of the back neck and shoulders. This is a good time to grade the inner seam allowance to reduce bulk. 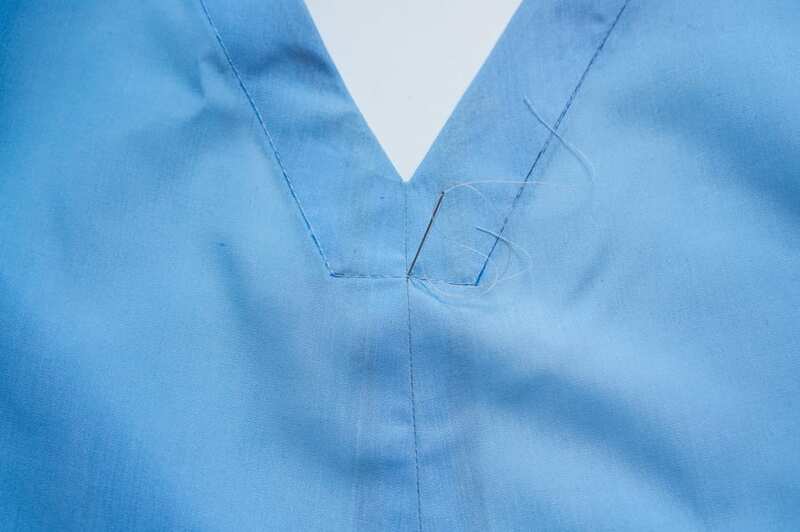 If you sewed your V point accurately, and were precise when you clipped into the V, you should have a clean V from the front. When you fold and press the facing to the back, make sure the facing doesn’t peek out from the right side. You can understitch the facing to help prevent this. 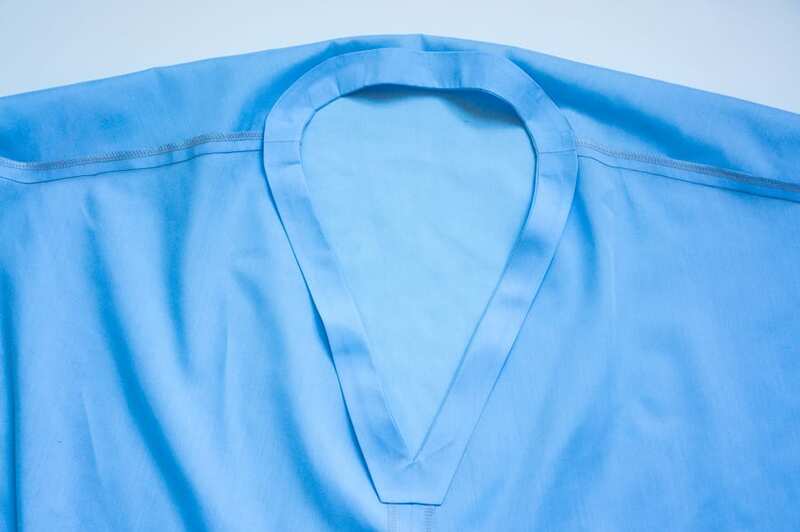 The last step is to topstitch the facing in place so it doesn’t shift or peek out while you are wearing your caftan. You can pin your facing into place, making sure the folded raw edge is properly tucked under. 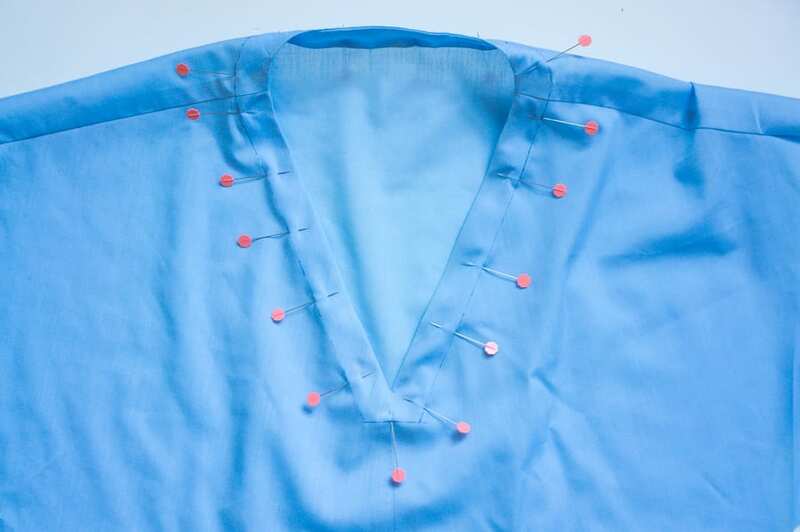 Another option which may help prevent the neckline from rippling or gaping is to use a fabric glue stick along the edge of the facing to tack it in place instead of using pins. Again, I really like to draw in my stitch line using a removable marking tool. It can be hard to sew evenly along both sides of the V point as well as around the curved back neckline. You want your topstitching to be an even 1″ from the finished edge, and drawing this in will help take any guess work out of this step. You can also hand baste if you’re nervous about using a marking tool on the right side of your fabric. When you are topstitching on the right side through the bodice and the facing, sometimes the fabric may shift and cause ripples. Glue-basting and/or switching to a walking foot can help make sure the layers of fabric are fed through the machine evenly as you’re sewing. 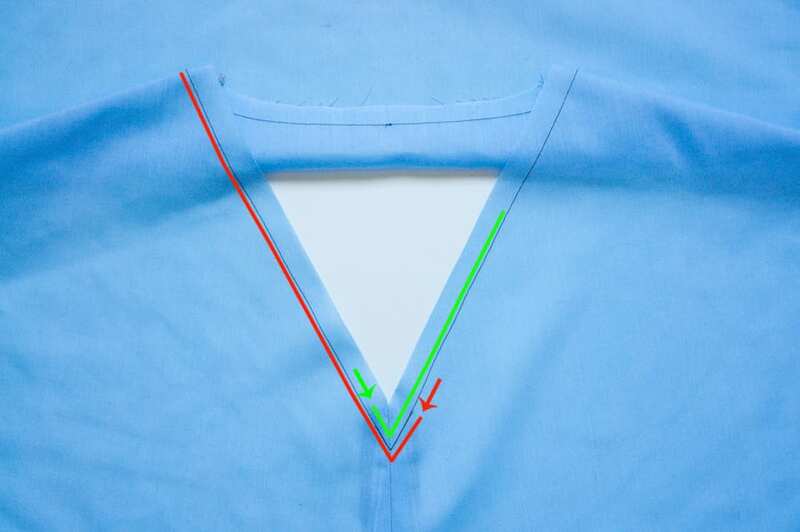 You can sew in one continuous pass, or if you’d like to be extra careful you’re not distorting the neckline, you can sew the two sides of the V neckline separately like before. Use your hand wheel to drop your needle down on the guideline you drew in earlier exactly on center front, and sew along the line until you reach center back. Leave long thread tails when you start and end your sewing, without backstitching. 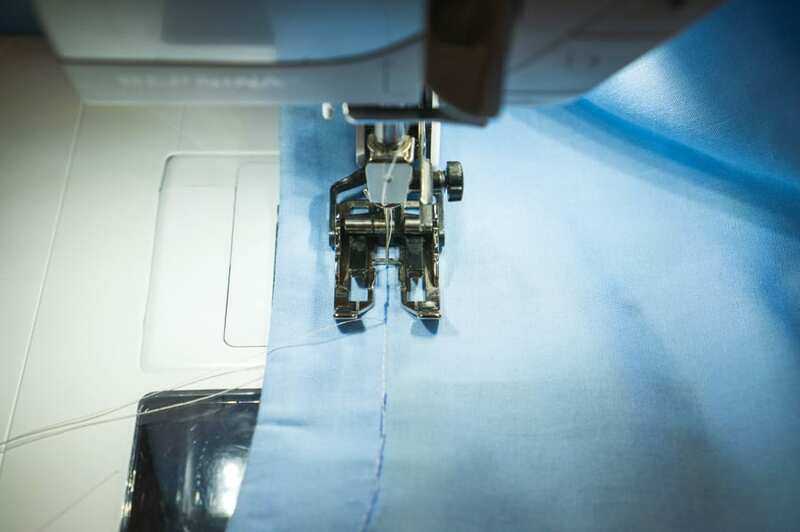 Then when you are ready to sew the opposite side, drop your needle exactly where you began the first line of stitching, and continue to center back to meet up both lines of sewing. 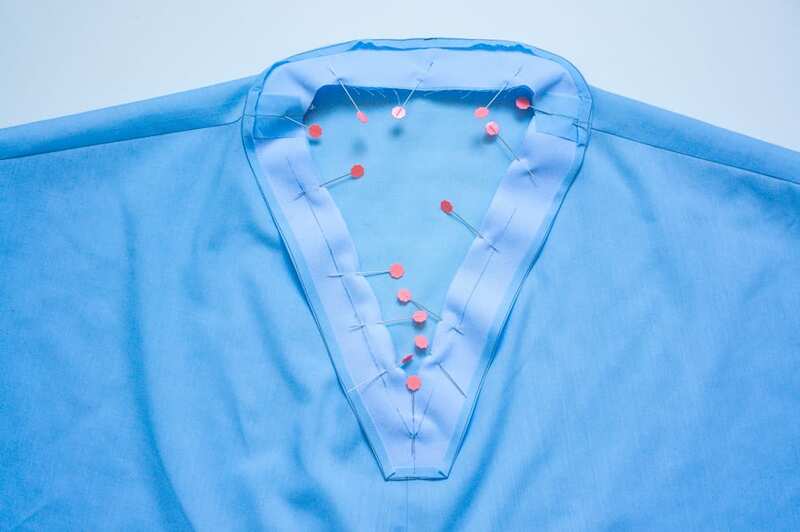 Take a hand sewing needle to pull your thread tails to the inside at both center front and center back and tie them off for a clean finish from the right side of the neckline. If you’re having trouble keeping the topstitching even at 1″ all the way around, sticking a stack of post-its at the 1″ mark can act as a helpful guide. 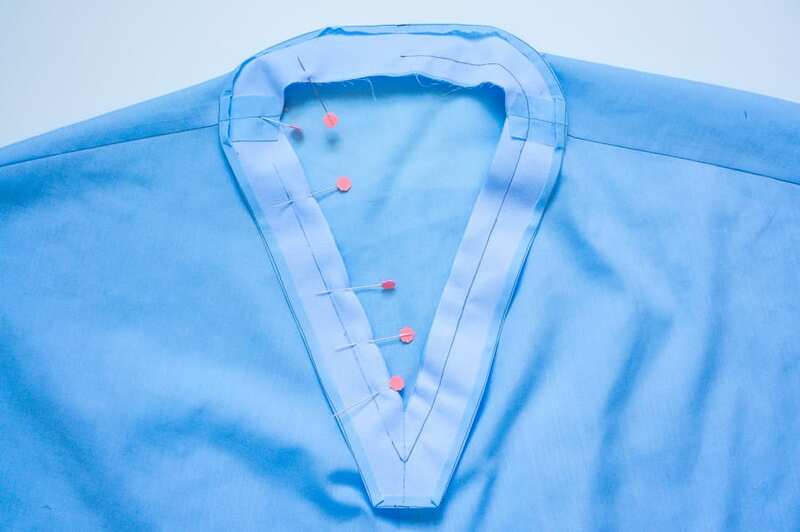 When you’re finished topstitching, give the neckline a good press. If the neckline is rippling at all at this stage, it can often be corrected by using lots of steam and heat, and a clapper if necessary. And that’s it for our Charlie related posts! 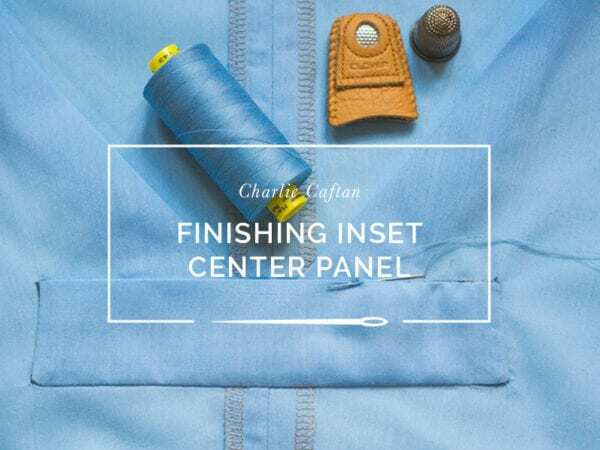 If you’d like help sewing the center panel, you can find our post on that here. I hope you enjoy the rest of your summer wearing your Charlies!